Professor Adam Scott Wandt was interviewed on July 13, 2010, by Elluminate Inc. on his research and development of the Elluminate vOffice. Professor Wandt sees Elluminate as a technology to “raise the bar in online learning” and brought its use to the National Online MPA-IG Program at John Jay College of Criminal Justice. This is an online course that utilizes several virtual meetings throughout the semester. In past semesters, WizIQ was used for these virtual sessions. This was the first meeting out of five (5) for the semester. Students received a thirty (30) minute “Elluminate Introduction” followed by ninety (90) minutes of course introduction. Students were then asked the following question in a Blackboard discussion forum. Students had seven (7) days to reply. Nine (9) out of fifteen (15) students responded. Please provide feedback about your experience with the Elluminate software. Since you were able to experience Elluminate first hand during the online class meeting, it will be great to be able to receive your feedback on the product. Your honest opinion will be greatly appreciated and taken very seriously. Lastly, do not forget to EXPLAIN the reasons why you do or do not like the program. I more then enjoyed my experience using the elluminate software! I have done web based conferencing before, and must admit, that elluminate is the best program I have yet to utilze. The ability to share documents so effortlessly, and to communicate as though I were actually in a classroom setting was great. The video feature is awesome, and I think that seeing your fellow students makes online classes less impersonal. I plan on convincing my superiors at work to consider taking a look at Elluminate as a possible option to reduce the cost and time associated with arranging and engaging in live meetings. Thanks for the exposure to this innovative new weapon, in my management arsenal. I found the Elluminate session to be very interesting. I wasn’t expecting i t to have as many functions and possibilities that it did. I did like it very much, although I was having a few problems with my internet during the session and I kept getting disconnected. I do not know if that was a result of the program or of my shotty Time Warner services. Having the webcam and sound was very helpful in understanding the course better. Overall, I found it to be a great program. I do not feel qualified to give an intelligent assessment of Elluminate because this is the first course I have ever taken online. Overall, I found it effective and very rich in features. However, the amount of memory it required, both physical and virtual was problematic for me. I am not a fan of it because it is java-based. I understand this is for compatibility reasons but the publisher should just create the software for multiple platforms. Elluminate is an excellent tool for a class such as our current class, PAD 770. I am excited to learn more about the Elluminate program as well as the SPSS program. One thing that I experienced with the Elluminate program was that there were many times that as the professor was lecturing, I would automatically be signed off the the class room chat and would immediately be logged on again. I would have probably have missed a minute or two of the lecture. Overall, Elluminate does seem very exciting to learn. By far, it seems like an innovative tool for success. I think that the Elluminate software could be really useful for online classes. It seems like it would be more useful in situations where meetings occur at predetermined times so that interactions can occur. I haven’t seen a recording of a class yet but just from our one online class I think having people involved would make the system much more useful. I was using a netbook for our class so there were all kinds of problems with the layout for me that I’m sure would be fixed on a normal monitor. But in case you’re curious about the problems with a small screen… There isn’t enough room for the virtual screen, the left hand tool menu/chatbox, and the webcam window so things were overlapped and had to be constantly moved around. Also the chatbox couldn’t show more than one line at a time which was annoying. I’m not sure how the virtual screen worked on the professor’s end but I think it would be easier if it just simply copied the professors screen so that things could be easily manipulated and multiple windows could be on at the same time just like a projector is used in a normal classroom. Another option would be to have the documents able to open on all students computers so that they could go back and forth through them at their own pace. Also the ‘video’ of the document was really slow. It seemed like there was a really slow refresh rate on the software. Because of the small screen I was using I had the webcam screen off to the side and off the screen a lot of the time, especially when we were going over the documents. I think hearing the voice of whoever is talking is more important than seeing them. I would give up being able to see who is talking for smoother performance from document screen. Elluminate software is a good tool to conduct online class. My only problem with software is the speed. I found the speed to be very slow. Also the program should be able to detect and adjust according to host screen resolution. I found that constant readjusting a little annoying. Over all it is a good platform. I believe the problems I indicated a minor software glitches which can be easy fixed with a good feedback to the developer. I have never used a virtual class room during my time here at John Jay so using Elluminate was my first. I enjoyed the ability the program gives you to see your classmate and professor. What I did not like was the differences in the way every one looked. There was no consistency. The problem with the microphones all working together can also be quiet ear splitting. The application sharing feature is nice, but there need to be a way that the pixelation can be fixed. The problem mostly occurs when pages are moving or being changed, I also see that i takes a while to refresh itself. If there could also be a way for the documents or power-points to be up on the white board so that we could get a better view of it and manipulate it as well. Other then that I can’t wait to see how the class goes. Aside from taking 45 minutes to try to get Elluminate to work on my PC, I think that this could be a very useful tool for online classes at John Jay. Although I believe that Elluminate should offer basic trouble shooting advice or Q&A on their website. In the 45 minutes that it took me to figure out on my own how to get into the classroom, I had a very hard time finding basic troubleshooting answers to why I could not get it up and running. On the plus side, to date I have taken two other online courses (both with the same professor), and had only met the professor face to face once at the end of the second course when I needed help. Other than that, I had no idea who was actually teaching or who my classmates were. Elluminate adds a personal touch to online learning and makes the class more like a classroom course. It is great to be able to see and hear who is speaking throughout the session – be it the professor or our classmates. I also like the feature of being able to show documents, although I would agree with Nora that we should be able to scroll though the documents and view them at our own pace. Overall, I thought the Elluminate software worked rather well. I was a little intimidated by it at first, but after Professor Wandt explained all the functions, it was a little easier to understand. I really like the idea that sessions can be recorded. This function is super important to online classes because of the nature of the class. Most people take online classes because they can not designate a particular time each week to a class. I think that any class that uses this software should take advantage of being able to record sessions and I don’t think that it should ever be mandatory for a student to have to be present at the time the online class is in session. I hope that no one’s participation grade will be affected if they are not able to attend the ‘live’ class sessions. Something I would ‘tweak’ about the Elluminate software is the way I wasn’t able to scroll through the documents that Professor Wandt was showing all of us. Maybe I didn’t use my controls correctly, but I would like to be able to take control of the documents so that I can look at it at my own pace. It was also really slow when he scrolled through the documents. I don’t know if that was just my computer or a fault in the software. It would also be helpful if multiple windows could be opened rather than just one at a time so that students can compare/contrast documents and not have to readjust the sizing each time. I like the idea of being able to see who’s talking, but perhaps we should be allowed to see more than four people at a time. I feel like it’s extra work for the moderator to have to click each webcam and each microphone every time someone new wants to talk. As a whole, I think the Elluminate software will be a significant tool for online learning. It’s more comfortable, to me at least, to see who is teaching the class and to know that I can talk to them through webcam if I am not able to visit their office. This type of interaction is better than using the telephone. However, I feel that it shouldn’t be required for students to have to have webcams and ‘fancy’ headset microphones. It would be one thing if this was a major that dealt with a lot of technology classes, but because this is a Public Administration class I don’t think that students should have to purchase this extra equipment. * All responses are published anonymously with the consent of the authors. This is a hybrid course that will be using Elluminate several times this semester. This was the third class meeting for the semester. The previous two sessions met in person at John Jay College. Students were given five (5) days notice regarding the Elluminate classroom. Students received a thirty (30) minute “Elluminate Introduction” followed by ninety (90) minutes of lecture on academic research using the John Jay Library Website. Students were then asked the following question in a Blackboard discussion forum. Students had five(5) days to reply. Eleven (11) out of thirteen (13) students responded. A recording of the Elluminate class is available upon request. Please provide feedback about your experience with the Elluminate software. Since you were able to experience Elluminate first hand during the online class meeting, it will be great to be able to receive your feedback on the product.Lastly, do not forget to EXPLAIN the reasons why you do or do not like the program. I really enjoyed my first experience with the Elluminate software and it is amazing how fast the technology is progressing. Elluminate definitely represents the last world of technology when it comes to e-learning, a very flexible teaching technique that connects people disregarding where they are located. I felt a little bit stressed and confused at the beginning; I didn’t want to miss a thing so I stayed focused and alerted till the end of the session. Also recording was another positive side of this technique, something you can have access to even when you miss a class. Echo issues were experienced may be because of poor quality of the headsets, that is something that has to be considered becaused interfered with the quality of the communication. The only concern I have so far is the fact that I do have another class afterwards. Unfortunately I did not enjoy the commodity of accessing the session from home that day. I used one of computer centers at John Jay to access this virtual class; I couldn’t even take advantage of the microphone because many other students were working at that area. This is going to be still a problem for the upcoming sessions. Overall , a great experience !!!!!! The idea of online class is very useful in a sense where it provides the ability to customize class time around a busy schedule. It has proven to be a much needed commodity in the world of education. The Eluminate is the best software for this purpose for the following reasons; firstly, I found it very easy to interact with, yet a person with a little computer knowledge may be able to use this software. Secondly, one can interact with the class and the professor in very easy manner since it just requires one click. Finally, it gives us a feeling as if we are sitting in a real class room with the ability to raise hand, ask questions (typing/microphone), and show confusion so professor can explain it better. Moreover, this software has the ability to record lecture and you can go over the lecture again and again to better understand the topic. One drawback of this type of education is you must have strict time management to keep up with the classroom. I really like the idea of a virtual class where you are able to interact and feel like you’re in a classroom when you’re really not. The software was working really good and is really easy to use. The only problem I had is that I have a class scheduled at school right after this class so I had to be in school anyway. Therefore, I couldn’t use my own computer and had to use the one at school, where I couldn’t add a microphone and participate by typing only. Like most of the class I enjoyed our last class. I had some minor technical difficulties (the sound and video would freeze for a second or two) but otherwise I thought the class went very well. This software would not work for some class styles but for the graduate level classes it should work well. The greatest flaw I see in using the software compared to a standard class is the amount of time it takes to involve the students. Lectures are ideal for this application but interacting with the students or others in the room takes up more time. As a professor do you feel you can cover the same amount of material compared to a standard classroom? I would also guess that students would ask fewer questions online as opposed to in person. Becoming for familiar with the software will fix these problems to a degree. There is also a greater likelihood of students getting distracted by other things in their environment, since they know that no one else can see what they are doing (This can also be a positive though as students can multitask). That said, I really did enjoy the class and think we should continue the use of Elluminate. As students become more proficient with the software classes will flow much more smoothly and at the graduate level student’s should have the academic discipline to not become distracted. The Elluminate program was a positive and intriguing experience for me. Using webcams and headphones is not something I would normally be involved with and Elluminate forced me to do so, leaving me pleasantly surprised. It was a great program that I absolutely think John Jay should continue forward with. The features on Elluminate (smiley faces, hand raising) led the class to carry on as if it were being run in a standard classroom. The fact that the professor could share links with the class while lecturing was the most impressive feature of all. Having a computer discussion between students while the professor was lecturing was also a great way for questions to be raised and students to be able to interact, which I think was extremely important. In class, students have no way of getting feedback from one another. In a lot of ways i feel as though Elluminate was more interactive than the classroom and I did not even need to leave my apartment to do it. Aside from glitches and echoes while different microphones were activated, I thought Elluminate was a great experience overall. Programs like Elluminate could absolutely be the future of education. I was unable to access the internet on campus for our last session; however, I was able to participate in the practice session a few weeks ago and I truly enjoyed the experience. It is a very simple, and straight forward program that is very functional of academia. I have not had an opportunity to experience the application sharing as mush as I hoped to, but from the limited experience I was very useful. One concern I had before starting the session was tha the program would be too slow to keep up with a fast pace of a classroom environment. However, simple functions such as the ability to answer “yes” or “no” questions with the “X” or check mark, make for little delay in the movement of a class session. I did purchase a headset, but have not had a chance to try it out with the system, It would be interesting to see how many students can be on headset at once without any interference or echoing. I personally think that Elluminate is a good program and that it could be convenient at times specially when you are home; unfortunately for me I have another class after this one and therefore I have to access the class using a computer at JJAY which does not have the right equipment. Aside this I did not have a problem during the session only that I could not speak or be seen directly. This is my first virtual class and I find it to be interesting and hope to learn more about the program. I liked the Elluminate experience, virtual classroom is very convenient for those students who can not be in the classroom because of their busy schedule. I do believe that to check the attendance everyone in the classroom should have a video camera (it should be a requirement for the class) and a microphone to ask/answer any questions. Once logged in to the Elluminate students are visible very well on the camera, voice could use some work. Echo is heard if more than one microphone is in use. So far we have experienced that only four people at a time are visible on the screen, from professor’s perspective to check attendance it would take too much time to move from one person to the other. Also, when all students are seen it could create a distraction since there is not much room for other screens to be visible (maybe there should be a separate board for that purpose only). I found Elluminate very effective for several reasons. First, the relay of information online was just as clear and comprehensive as in the physical classroom. Furthermore, I do believe that since the comfort level increases when participating in the class from home, attention span also increases because you no longer keep track of time or think about the long trip home. The level of learning I think also enhances in the virtual classroom because the intimidation and fear of asking questions lessens due to a more discrete virtual participation. I think students asked more questions online than in the classroom because they felt more confident. The application sharing tool enhances learning as well because it provides easy access to powerpoint presentations as well as the web. I found presentations easy to view and navigate. One of the most innovative features of virtual lectures has to do with the fact that students no longer have to worry about trying to copy someone else’s notes written with bad handwriting. Whether a student gets sick or has to miss a class for any reason, they can view the two-hour lecture online. Such feature can enhance student grades on the exams and papers. While the face design of the application can improve and become more user friendly, the overall effectiveness of virtual learning surpassed my expectations. I strongly believe that PAD 701 (the current online course I enrolled in) should start implementing this software as soon as possible because the level of learning I obtained from one Elluminate class strongly contrasts with the past three weeks of PAD 701 online course. In conclusion, I don’t think that every student should require a webcam for the course because the headsets are just as effective. My experience with the Elluminate software as one of the participants was great. It was typical of a classroom and a more advance system of learning. It was a well-organized classroom environment. It was easy and captivating. It captured my attention in a relax manner all through. I love it and I look forward to having more classes on the program. Connecting to the software was difficult at the beginning; I would like to suggest that the class be thought on how to connect to the program prior to the elluminate class. I also would recommend that the echo from the microphone or speakers be look into. Besides these minor defects, I would prefer it to the regular classroom. The experience of having an online class was really exciting and thrilling in a way. On one hand you sit at home on your couch with a cup of tea and on the other you are directly involved in a class discussion and listening to professor’s lecture. Overall I think that virtual classrooms such as Elluminate are effective and very convenient for most of the students. The bad weather also plays its role- you don’t have to wet your shoes in order to attend a class. If asked about drawbacks, I would mention the slow pace of the process from the side of the students. That was noticed when students wanted to ask questions, the turning on and off of the microphone and the web camera took some time before one could set oneself to actually ask the question. The fastest way to do it proved to be the typing into the chat box. Other than that, the span of attention is an important issue. Students may be easily distracted during virtual sessions, e.g. someone rings the door bell, the kettle whistles on the stove, the dog runs over your computer etc. I think a good response to this problem would be notifying students well in advance (those who are not engaged from the beginning in online classes) about the date of a virtual class, so that they may really set aside any other things during that time. Also the recording of the class is a very good solution, it is very nice to have the opportunity to always go back if you missed something. Above all, thank you for a wonderful experience. This is an online class that will make use of Elluminate several times during the semester. This was the students first exposure to the software. Students received five (5) days notice of the Elluminate lectur e. Students received a thirty (30) minute “Elluminate Introduction” followed by ninety (90) minutes of course introduction on Elluminate. Students were then asked the following question in a Blackboard discussion forum. Students had 7 days to reply. Ten (10) out of fifteen (15) students responded. A recording of the Elluminate class is available upon request. This virtual classroom is a possibility to expand the teachings online and your honest opinion will be greatly appreciated and taken very seriously. Lastly, do not forget to EXPLAIN the reasons why you do or do not like the program. I personally tend to be a bit shy in classroom setting and online courses allow me to express my thoughts/opinions and Elluminate doesn’t seem to hinder my feelings. So, so far “two thumbs up”. Now I do have a question I started with Black Board back in early 2005 and there used to be a virtual classroom through blackboard did that get removed with the upgrade. Also Prof. Harrow I think it’s essential that when students registered it is noted that they will require a webcam/microphone for this course. Just FYI.. It was a great experience. It would more helpful if we would be able to see all students at the same time. Or have an option to choose who we want to see. I hope that next time more people will attend and everyone will have headphones with mic. I was not able to get online and be part of the virtual classroom. I was working that night. The presentation was very important because the professors discussed the requirement for the course including the IRP project. I was unable to access the virtual classroom when I tried for the first time. The Elluminate software was not working when I tried at first with the Internet Explorer browser. I downloaded Firefox and it worked. I tried the software today with Internet Explorer and its working too. The software is good because it’s has a user friendly interface and the sound and graphic were clear. This is my first time taking an online class and I’m amaze with the way the education system is progressing with the use of technology. This software offers the students that have a family and a full time job the opportunity to advance in their education and obtain a college degree. There are other video conferences software in the market that we could try throughout the semester to see the differences and enhance our video conference experience in our course. Some of these videos conferencing software are IBM Lotus Live, Cisco TelePresence and Skype. I was unable to attend the live session but watched it afterwards and found it to be a great new aspect to online learning. I knew that live online sessionsI were possible but didn’t realize we were able to use such technology at John Jay. I’ve taken a few online classes but by having a type of virtual class room, I think it will make this class that much more rewarding. Unfortunately, I was not able to participate in virtual classroom provided through the Elluminate Software. Despite that fact I truly believe that the Elluminate Software is one of the greatest innovations created to improve communication through video and audio technology. The only concern I have is the lack of experience and knowledge of the software. Being unable at the beginning to get even the access to the recorded lecture (as I heard I was not the only one who had problems with opening the link) was simply frustrating and embarrassing. I would like to benefit from this program as much as I can, but I would rather prefer to have some sort of training before I started to use it. For someone who is not really advanced in computers and technology, the way of figuring out the basic steps by myself can take forever and might not to be as functional as it should be. I have utilize software similar to this before but I find Elluminate to be more easy to navigate. It provides a wealth of different options that make it easy to accomplish any goal one may have. I find it to be very beneficial and I feel that it should be incorporated into all graduate programs both within and outside the CUNY community. I agree with you , Im surprised I have never heard anyone mention it before. None of my friends have ever used it in their colleges or universities. It is especially helpful in snowy conditions like today and tomorrow. I am sure more classes will make use of it as it becomes more popular. Maybe not for regular classes because students attend class in person but definitely for online classes. Illuminate software is similar to Skype, however, the first one is more convenient because it gives the ability to see up to 4 people simultaneously. The only one real concern is about frequent troubleshooting with the sound. Illuminate program catches a lot of outside sounds which bring some noises. But for the purposes of virtual classes and conferences, I think it works quite suitably (however, it needs more modifications in quality of video as well as sound). I didn’t attend the virtual classroom on the actual date but I did watch it at a later time and I thought that it was very interesting and it reminded me of skype because of the use of web cams, microphones and how you interact with people over the web. I believe that this form of virtual class room is a great way of doing things especially if and when you have an issue and it might be easier for a person to communicate with classmates or the professor and get feedback on assignments or some other issue. I think that Elluminate will be a good thing for those students who aren’t exactly familiar with technology when it comes to the computer and different applications and how they may work or who aren’t familiar with the whole online class process. I have to say that at first I was wondering what is this that they want us to do but then when I watched and saw how elluminate worked it opened my eyes to a new way of running a classroom, I’m familiar with the whole online class process but never anything like this exactly, it was new to me as I’m sure it was new to most of the students in this class. I can see how it might be intimidating to some but it never hurts to learn something new because who new elluminate existed? I would have never known about this if it wasn’t for this experience. I see this as something good and a fresh new way of getting everyone involved. Thank you for the experience! I also thought it was similar to skype. I def agree with your comments and I am too looking forward to using it for this class. Unfortunately, I was unable to attend the live session on Elluminate. However, after viewing the video that was recorded from that night, I believe it is great tool for enhancing academic learning. This new way of online learning is almost similar to the traditional classroom. Being able to listen and watch the professors and other classmates speak, with the use of webcams and microphones, is very helpful and informative. I like how this live virtual classroom can provide interaction and immediate feedback. In my opinion, this is an excellent course for students to sign up for and become more comfortable with computers and technology. Before this course, I had no idea what Elluminate was or that it even existed. I logged on to watch the virtual classroom lecture and I was impressed. As someone who does not know much about technology I found this to be more comforting and personal. I wish I could have joined in on the actual live chat but it was great to be able to see both professors and even classmates. The feature I really enjoyed was the messaging box where we could type in comments or questions which were addressed by the professors. I also like the fact that we can revisit the chat and rewind any parts we want to view or hear again. It is as if we have a personal video recorder in a classroom and we have the ability to take notes and hear our professors as many times as we need to understand what is being covered. I can also see how this could be intimidating to some students and a bit odd to get used to seeing oneself on camera on the computer screen. I was intimidated a bit myself even though I did not participate in the live chat. I guess it is a matter of adjustment. It can also be a bit stressful and I think there should be several training sessions with the professors so each student can test their head set, microphone and camera before they have to use it in a group project just to ensure that they are in working order. Another suggestion I have is to offer the chat later during the night so everyone can participate (maybe around 8 or 9pm) and on a day when no one has class (e.g. Sundays). I can see how students, due to work schedules or other classes, would not be able to participate and take advantage of this program. Overall I like Elluminate because it is practical and I can definitely see it being used nationwide in many companies. It can be used for various meetings and it allows people to work from home. I am looking forward to the challenges this course will present. I am both excited to learn new things but also a bit intimidated. I like to receive all assignments ahead of time because it makes it easier to manage along with other classes and work. Being in control of what is assigned is important to make sure that all assignments are complete with all that is required before the deadline. I know we have to log in several times during the week to comment and give feedback on other people’s work but I hope we can have it outlined ahead of time, which seems like it has been indicated on blackboard. This course will prepare each student and challenge us to be self sufficient. I know that there is zero tolerance policy on lateness, I just hope we have enough time to complete each task. The introductions were great and the vcard assignment was something different but something I will definitely use at work. This course is a requirement for the MPA program and a very crucial course because technology is growing. I don’t think this would be a great masters program if it didn’t prepare its students to what they can encounter in the real world. If we put in the time now, it will be a lot easier in the future. Thank you for introducing me to something new. Although I was not present at the lecture, I had no problems in accessing the recorded session the next day. I believe that Elluminate provides a revolutionary method of teaching that is more convenient for some teachers/students. This software allows for actual teaching in an online course rather than just providing assignments and written lecture notes. I like how the software allows you to see multiple people on webcam rather than just the instructor, as well as the listing of everyone that is in the “classroom”. Also displaying who is specifically talking (if they do not have a webcam) is also very useful. Although I have not used Elluminate before the first lecture of this course, I have no specific negative things to say about it at this time. The Elluminate lectures are very interesting. It is a way of learning about the technological advances that are being made today. Years back we would never have believed that this type of online classroom setting would be occurring. I found it to be an educational way of showing us new ways of learning, while keeping the students involved in a virtual setting. 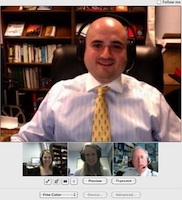 Due to a snow storm, students were asked to attend a virtual lecture in place of their standard class meeting. This was the second class meeting for the semester. Students received a thirty (30) minute “Elluminate Introduction” followed by ninety (90) minutes of lecture on US Federal law pertaining to computer crimes. Students were then asked the following question in a Blackboard discussion forum. Students had seven (7) days to reply. Ten (10) out of fifteen (15) students responded. A recording of the Elluminate class is available upon request. Overall, I would have to say that my experience with the Elluminate software and my ability to experience Elluminate first hand during the online class meeting was extremely positive. I am being completely honest when I say that, initially the idea of using the Elluminate software and participating in a virtual class were concepts that were both ‘foreign’ to me. Especially since I consider myself to be someone whom possesses the basic skills of computer use. Henceforth, I have heard of online courses and the use of a discussion board – but a virtual classroom? Immediately, my mind became bombarded with curiosity and questions. Specifically, these questions consisted of the following: What is a virtual classroom? Is the Elluminate software and the virtual classroom features going to be fairly easy to operate? Is the virtual classroom going to serve as a sufficient method for class lecture and learning the course material? And, could this software (as well as other possible software’s) serve as a method for future education? After actively participating in my first-hand experience with the Elluminate software and the use of a virtual classroom, I honestly feel that it was both an interesting and beneficial experience. Despite this being my first time in a virtual classroom, I felt that the software itself and the virtual classroom features were fairly easy to understand and operate. Specifically, because I was able to enter the virtual class a few minutes early and familiarize myself with some of the features and settings. Additionally, I also thought that having Professor Wandt take the time to explain and have us test out some of the features helped better familiarize everyone with the use and understanding of the program. Although we did experience some technical difficulties during the online session, I felt that they were minimum considering the software was being used in the middle of a snowstorm. While in the virtual classroom, I was absolutely fascinated with the fact that I was actually participating in an online class lecture right from the convenience and comfort of my own home. Just the mere fact that I was sitting comfortably on my futon listening to the class lecture, viewing the professors PowerPoint presentation, and taking notes just as I normally would while sitting in class absolutely intrigued me. Furthermore, it was interesting to hear some of my peers talk and make comments regarding the lecture through the use of the required headsets. Personally, I was unable to purchase my headset prior to the online class lecture due to the inclement weather conditions, so I had to type my responses and/or comments; but the headset is certainly a feature I am looking forward to using next time. In terms of evaluating the overall benefits that the Elluminate software and the use of virtual classroom programs has in regards to students, faculty, and the future of educational institutions, I personally feel that the implementation of this software could be the future of enhancing education and online class instruction and/or obtaining online degrees. Personally, I feel that this software is beneficial to academic institutions because it provides students with more access to online courses and possibly earning more online degrees. Specifically, this may serve as a more beneficial method for students and faculty because it eliminates commuting expenses and time restrictions that may make it difficult to attend/teach class. 12px/normal Arial; margin: 0px;”>In conclusion, I don’t think that every student should require a webcam for the course because the headsets are just as effective. After using the program online for our class session, I feel that it has potential to be introduced into John Jay, but hopefully with some future changes. While in the session, Prof. Wandt informed us that he would be recording the session. That I thought was a great idea because it allows users to go back and review what was talked about at a later time. With this though, I feel that the users should be also allowed to record, in which they would be able to save the recording onto their personal desktop/laptop for them to review as well. If the professor didn’t record it, but maybe I did, I should have that option. Also when Prof. Wandt (Moderator) recorded it, the program should also allow users to save that recording, even though they didn’t initiate it. Secondly, I feel the use of screen sharing/viewing files shouldn’t be limited to a single file at a time. I remember in the beginning that the professor couldn’t post two files at once for us to view. I understand maybe the purpose of it, to save bandwidth, but feel that the functionality should be in place incase the need to compare files from different users at once. Lastly, the third thing I have is regarding the chat in the program. It seems that if everyone had a microphone and if the moderator didn’t restrict the use, all that other users would hear is everyone talking at once, in which nothing would probably be heard. If there was a way to tie in the “hand raising” in which when a person is called on, the program only gives the chat access to that person. I understand Prof. Wandt was doing that manually which is fine because there was only 10-15 of us in there, but if there was a group of 100+ people, it would take most of the time just switching on and off the chat for people, wasting valuable time. Elluminate is a very useful tool with much promise to the concept of online teaching. Coming from the private sector I often use webex or turbomeeting to facilitate product demos and general meetings. I found elluminate to be very intuitive with minor issues in sound quality, lag and general typing pane, which was relatively small. All in all I think the product is a success and should be looked into further as it offers a very unique way of teaching in a new technological age. Pros: webcam/mic support, interesting classroom tools (I.e. raising hand button, check marks), ability to present or share your desktop, good administrative tools. In my opinion, the “Elluminate” online class is a helpful addition to our learning experience. I thought that the online class went pretty well for a first time run, with minor bugs that had to be worked out, such as the audio distortion, which may have been a result of the weather. I know that some had an issue with the PowerPoint pages not loading quickly, but that was not the case for me. While only one student had a webcam, and most of the others did not even have a headset/microphone yet, I thought that the class ran smooth enough through the use of the “chat” messaging box and the “raise your hand” option. The combination of being able to view the PowerPoint presentation & listening to Prof. Wandt’s discussion of the material was comparable to being in a classroom, yet I was in my own home 65 miles north of NYC during a snowstorm. Overall, I regard the “Elluminate” online class as a success, considering that we were able to cover most of that week’s material despite the snowstorm and the college being closed. I feel that it will be a useful tool to supplement the class in situations of bad weather or the Professor being out of town. At first it was difficult to understand the virtual system. On my end it took some time to load. Overall i think it is an interesting program that is great for home/ school communication techniques. Being that i was extremely weak and sick it made it even better for me not to have to travel through the snow to the actual classroom. I think the more familiar i become with this system the more i would be able to understand and navigate through the system. I thought the use of the Elluminate application was a very good substitution of an in-class session on the same material. While I found connecting the microphone and initial log-in took somewhat longer than originally expected, the components seemed to work well in allowing us to communicate as a group. I think as we gain additional understanding of the use of the system the initial bugs experienced will work themselves out. I am not fond of on-line classes as a whole, but do realize that they can be utilized in certain cases (such as during a school closure or some other circumstance that may prevent you from attending class). I would even propose that this service be available in the event members of the class may unexpectedly be unable to attend during the semester. The information was well communicated, and we all had the opportunity to ask questions and interact, even though it was a new experience for many. I did find the use of the text messaging option somewhat delayed and cumbersome, as the discussion seemed to have progressed beyond a particular concept by the time someone would post their comments. Equivalence of components (microphones, headsets, etc) may serve to eliminate this problem. I also though the view of the windows on one screen seemed to be crowded. While reviewing a document, I was unable to see the images of those in attendance by web-cam, although the audio was clear and understandable. All-in-all a good experience, with potential for additional use. The experience with the virtual classroom was very interesting. At first I honestly thought that we will not be able to cover much due to the fact that we were at the comfort of our own home. However after starting the lecture I found that everyone was present and the material covered was fairly simple to follow and easy to understand. Yes there were a few minor disadvantages with the audio and internet connection however the weather played a major role in that aspect. I believe the program is extremely useful and once it starts to be used more frequently it will be very helpful.. I also believe that by having such class meetings the students can develop good communication skills and understand more of the importance of technology…. The program is not yet perfected and it will probably take some time to do it. I strongly encourage the idea to use this virtual classroom in the future. I enjoyed Elluminate. It was pretty simple to operate. The features such as the ‘raise hand’ and ‘poll’ buttons were interesting. The chat box was also helpful, seeing as how I did not have a cam or mic. Aside from the sound glitches, I did not encounter any problems once the program was loaded—the slides/shared files appeared hastily and the videocams came in clear. It did, however, take around 10 minutes to log in, even though I did a test log in earlier and it took less than a minute. I guess it depended on the bandwidth and/or the number on people simultaneously trying to get in. All things considered, it was a useful experience and I would not mind using it again. I thought that there were a few glitches with the audio and video. I didn’t like the length of time it took for some of the slides to load on the screen and the way the slides looked on the screen even when they were adjusted. However, It was great to still be able to receive a lecture despite the inclement weather being a deterrent to meeting in the classroom at John Jay. I liked that I was able to be in the comfort of my own home. Overall, I was comfortable with the online class meeting. Today, there are a plethora of virtual classroom and meeting products on the market. The issue is further complicated by the phenomenon that new options and products seem to appear on a regular basis. Therefore, deciding which product to select for my program will not be an easy decision. Choosing a product is dependent on one’s needs, and the product I ultimately choose may not be the right one for you. Each educator and/or institution must research all options available and make a decision independently based upon their individual needs. The purpose of this series of blogs is to help educators learn what is out there and what the advantages and disadvantages are to each, so that individuals can make informed decisions on which product to use. I hope you find this information helpful. Two years ago, I used GoToMeeting in my online classes. One of the features I like most about GoToMeeting is that it allows application sharing, which allows me to use SPSS, Excel, PowerPoint, Word, and other programs live on the Internet with students. Additionally, GoToMeeting is great for extra help sessions. Quite often, students contact me at 10:00 pm with questions regarding a program, quantitative method or website. It is easy to use GoToMeeting and view the student’s screen live as they attempt an exercise. 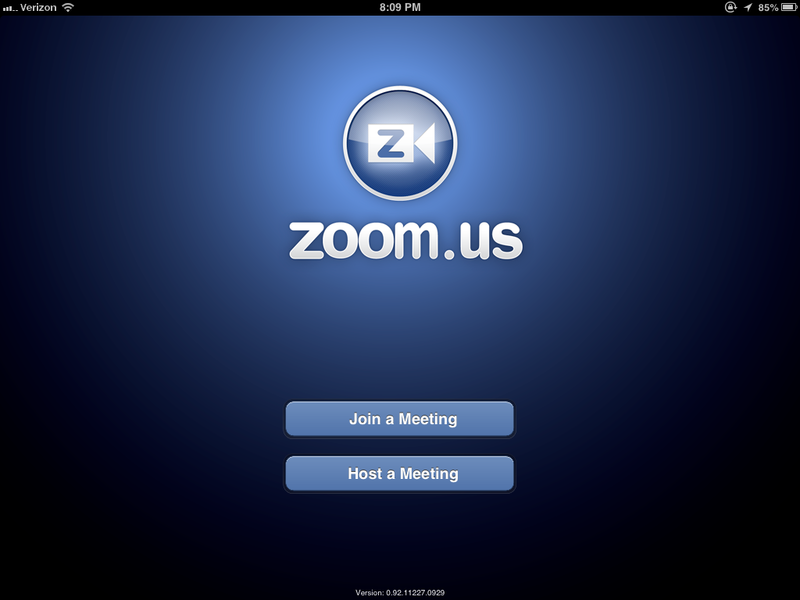 GoToMeeting is also useful because students can view digital lectures if they are unable to attend class. The lecture can be uploaded to a server or blackboard. One of the downfalls of GoToMeeting is the large file size of the digital lectures. The first year I used GoToMeeting I took advantage of an introductory rate that was fairly good (~$350). The second year I paid the full price ($468.00). I stopped using GoToMeeting after the second year because I simply did not want to self-fund another year. I asked John Jay College to fund a license for the product, but it never panned out and so I stopped using the program. The high price of GoToMeeting led me to a second program. WiZiQ is a free alternative to GoToMeeting, but it lacks several functions, including sophisticated application sharing. However, WiZiQ does come with the ability to host centralized recordings of virtual classes for students to view later. WiZiQ also has a premium membership for $100 per annum, which includes unlimited class recordings and downloads, co-brand virtual classroom, invoicing and payments handling, and get leads via learning requests and priority support. Class sessions are limited to 5 hours. I have not purchased the premium membership, but I believe it is an affordable option and a good deal for those who may wish to use it. One of my colleagues at John Jay College, the Deputy Director for the National MPA-IG Online Program, took a serious look at WiZiQ with the MPA-IG students. They concluded that although the program has unique and useful options, WiZiQ is not as advanced as other services. With only a few students in a classroom the program worked well, but when more than 15 students were in the classroom, lagging was a problem. In addition, there was yellowing of video on multiple occasions and occasional freezing of videos, regardless of the number of students in the classroom. Our issues with WiZiQ led us to Elluminate. Elluminate provides virtual classrooms for up to 50 students for $499 per annum. Elluminate has powerful video conferencing capabilities and can support up to four webcams at a time. Users must wear podcasting headsets (something I am really not happy about), but this leads to superior sound quality – even with multiple speakers. It also has whiteboard and application sharing. Out of all the services tried so far, Elluminate seems to be the leader and will be heavily tested during the Spring 2010 semester. Students’ reactions, surveys and other information will be available on this blog. Check back soon for additional information. One of my assigned duties for the Spring 2010 semester is to research and evaluate different options for virtual classrooms and lecture capture for the National Online Master of Public Administration – Inspector General Program. The types of products I will be evaluating include virtual meeting spaces and lecture capture. In regards to lecture capture, I will focus on Integrity, Snapz Pro, and Mac OS X Podcast Producer 2. In regards to virtual meeting spaces, I will be looking at Elluminate, WebEx, WizIQ, GotoMeeting, and possibly Adobe Connect. I am also open to adding new options. Lots of technology, so little time! Check back soon for more blog postings and developments. by: Adam S. Wandt, Deputy Chair for Instructional Technology, Department of Public Management, John Jay College of Criminal Justice.